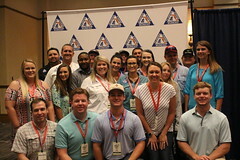 The 2019 Florida Farm Bureau Young Farmers and Ranchers Leadership Conference is sure to be a great time! Join us to “Ready. Set. Grow!” July 12-14, 2019 at the Daytona Beach Hilton. We’ll race you to Daytona! $100 for Early Bird Registration until May 15. Conference Scholarships Apps Open April 5.